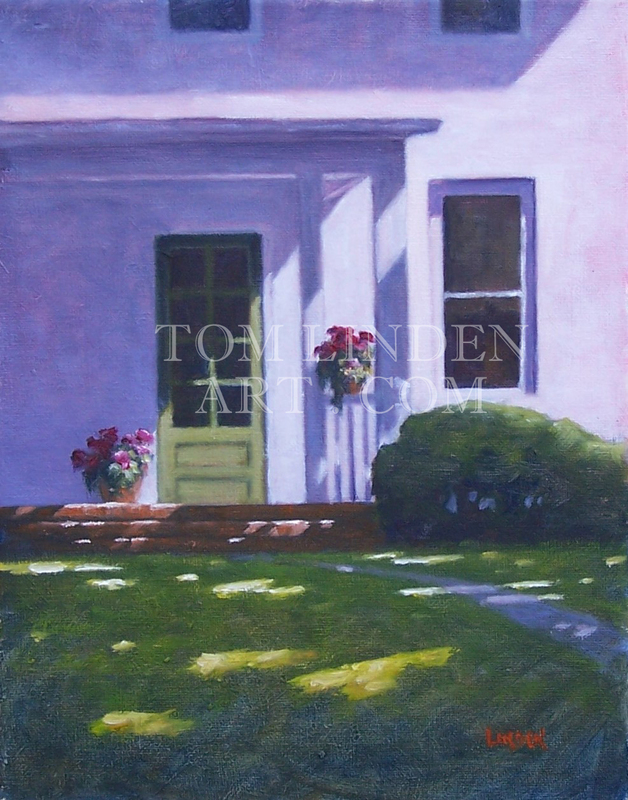 A couple years ago during the Fields Project, I made a small watercolor sketch of this front porch (less the flowers). I loved the patterns of the shadows and the dappled sunlight on the grass. I was not happy with the finished watercolor. 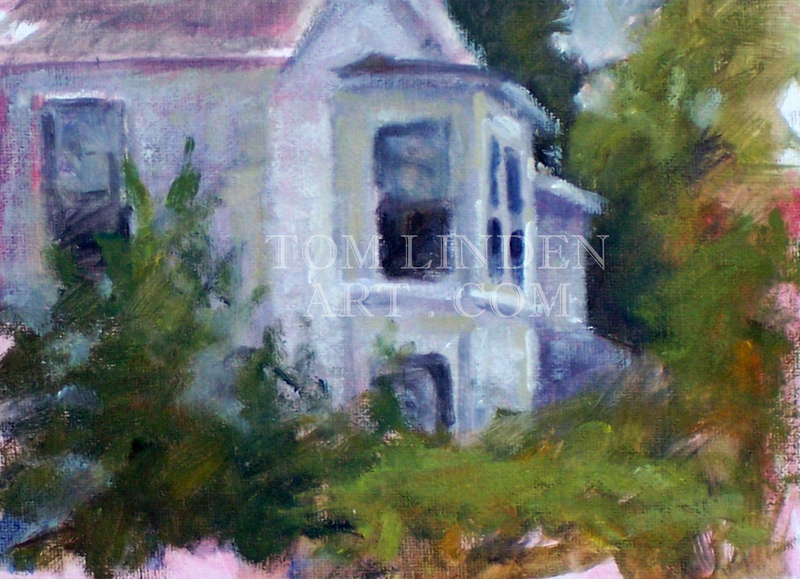 As sometimes happens with watercolors on location, I was unable to capture the values and colors that I saw. Perhaps it was the media. Perhaps it was the paper. No matter, it just didn’t do it for me. Recently I came across the watercolor painting and decided to play with the design in oils. I did a couple pen sketches as a warm up and to reacquaint myself with the scene. The sketches woke me to the idea of including the pots of flowers to add color, items of interest and a stop to the center of interest. Not sure that this will work in a larger format but it works well in this size. It was on display at the ArtScene held last week. Several people expressed interest in the work, but as of today, it is still available. Speaking of ArtScene, I had a number of interesting conversations. One in particular was memorable. As I have noted in previous posts, I do not allow people to take photographs of my works. I have small signs posted at my display asking people not to take photos. Late Saturday afternoon one gentleman broached the subject. In a rather testy demeanor he asked why he was not allowed to take photographs of my works. I took a moment to look at him and determine whether he was just kidding. I could tell by the look in his face that he was serious. I looked at him and inquired as to why he felt it necessary to take a photograph. Perhaps he had a good reason. The fellow responded that perhaps he was just too cheap but he didn’t see the problem. I followed up by stating that in taking the photo, He gets some use out of the image. I however receive nothing to help me purchase more paint, or more canvases, or more brushes, or frames, or sketchbooks. It would not help me to afford the entry fee which I pay to be at ArtScene. 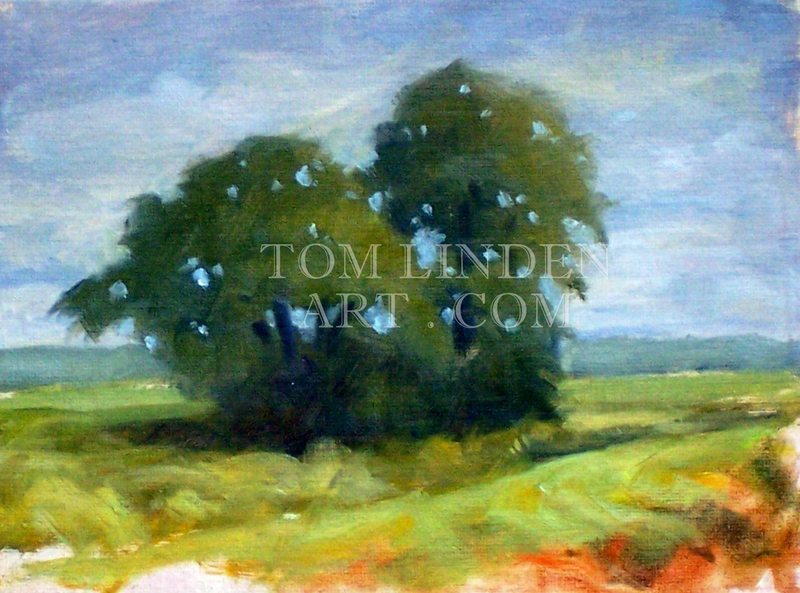 It would not help to pay for the gas, or maintenance, or insurance for my car which enables me to find and paint these scenes or get all of these works out so the public can see them. It does not pay for the entry fees, or shipping charges to get these works into competitions where I can help to improve the value of my talents. It does not help me pay for my website. In summary, to take the photograph would allow him to have something of perceived value, while I would be left without the ability to continue to bring my vision, my art to the market. Although I did not make the sale (which I knew would not occur anyway) at least he did not steal from me. I was flipping through one of my sketchbooks and came across a design which I witnessed during the Fields Project a couple years ago. I decided to play with it. Happy with the results, but not sure that it will work in a larger format. 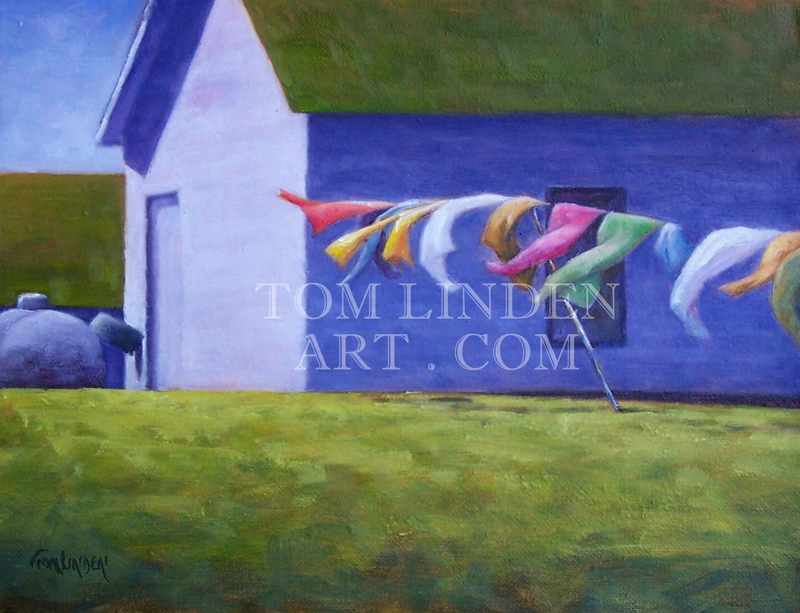 I did receive a few positive comments during this past weekends ArtScene. I “started” this work late last summer. It has been on display, but I was not satisfied with it. I finally figured out what bothered me. The feeling of light on the barn was not as pronounced as it could be. 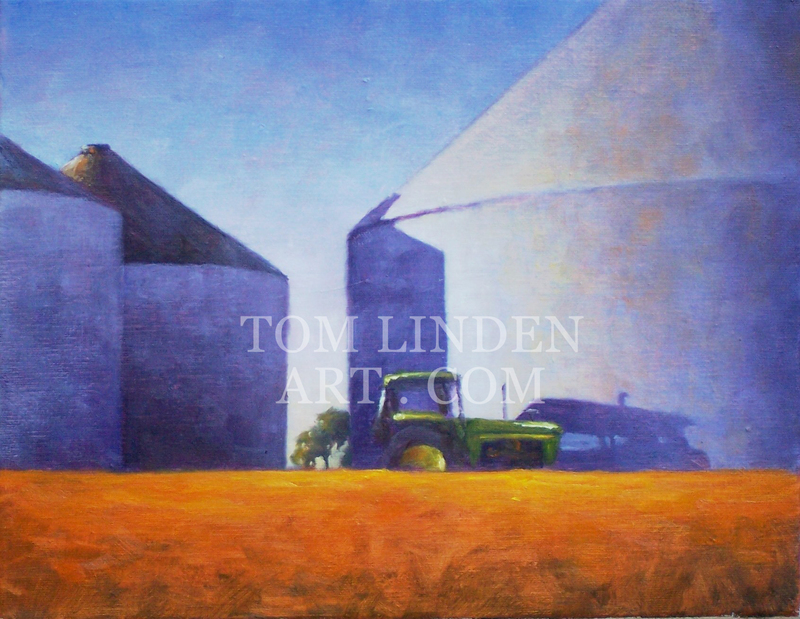 I recalled that when creating the plein air piece during the Fields Project, the sunlight had been visible on the side of the barn for a few moments before clouds rolled in. Since this work had not yet sold, I figured it was okay to make a couple changes to pump it up. 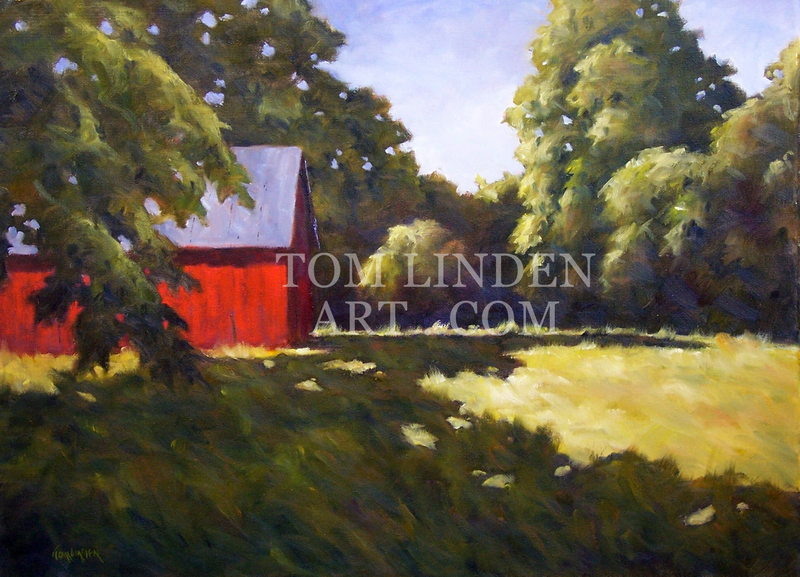 After adding some Cadmium Red Light to the barn and a few adjustments to the foliage, it was finished. Actually worked as a good warm up before my day of painting. While participating in the Fields project a few years ago, I strolled down a country road during the final hour or so of the day. Along the way, I experienced the sight of a tractor parked in front of grain bins and took a photo. I took the photo to capture the details of the tractor. A couple weeks ago, I came across the photo and admired the great abstract design possibilities. I spent a few minutes making quick thumbnail drawings to play with the design and find a format that I liked. I decided on this design and started in on it. It is always fun when you can work on a painting that seems to paint itself. Before I knew it, I was nearing the end of the painting and began to get cautious about going too far. It is all to easy to overwork a painting. You are currently browsing the archives for the Fields Project; Oregon, IL category.